My insulin pump administered ten units of Humalog in my sleep! I must have rolled onto it the wrong way, and the buttons got pushed! HELP!!! I splurged. I drank the entire island-themed mixed drink with all of the sugary syrup, and I forgot to bolus. Where is the insulin vial that’s normally bouncing around in my purse? My meter says “HI” but it’s not the same friendly “Hey what’s up hello” a la everyone’s favorite rapper, Fetty Wap. I could drink an entire gallon of water. “I’m low.” Even if I’m not low, maybe that reasoning will be enough to make him stop this time. I’m so tired of needles. It’s not even the momentary pain. It’s the voluntary submitting of myself to another human being whose societal title raises him or her “above” me. Doctor. Patient. Needle. I’m not signing up for this again. One month off from appointments won’t make or break my health. But then the baby kangaroo hopped over to me. Overcome by its cuteness, I hugged it tightly. Baby Joey reacted by biting my hand, slicing into my thumb. Mom tried to catch him so we could test for rabies, but he bounced away into the woods. Rabies shots? No, please no more needles. Can we just wait a little bit? My doctors will be back from vacation soon and then we can move forward with the shots. This is supposed to be one month off! Please! I promise I’ll be good. I always assumed other diabetics dreamed about diabetes as often as I did, until an impromptu and unscientific Twitter inquiry informed me otherwise. Some #doc members replied that they had only dreamed of diabetes once or twice; others shared a few humorous tales inspired by overnight hypoglycemia. I am in the Twitter minority that dreams of diabetes on a weekly basis. The snippets illustrated above come back to one resounding theme: There is an emergency, the odds are against me, but I somehow am responsible for getting myself out of trouble. Life with diabetes in a nutshell, if you ask me. We just look pretty damn brave while we live it every day, so others do not always notice our superhero capes. Along with some valuable assistants, I have moved mountains to quell my anxiety in recent years. Anxiety will always be there, but it does not have to be the loudest voice in my head at all times. What saddens me with these regular, scary dreams is that my body is subconsciously in survival mode even when at rest. Diabetes never sleeps, and neither do we. The good news is that these dreams have value. The incessant cravings in the McDonald’s line? Yup, my body is signaling that my blood sugar is low. 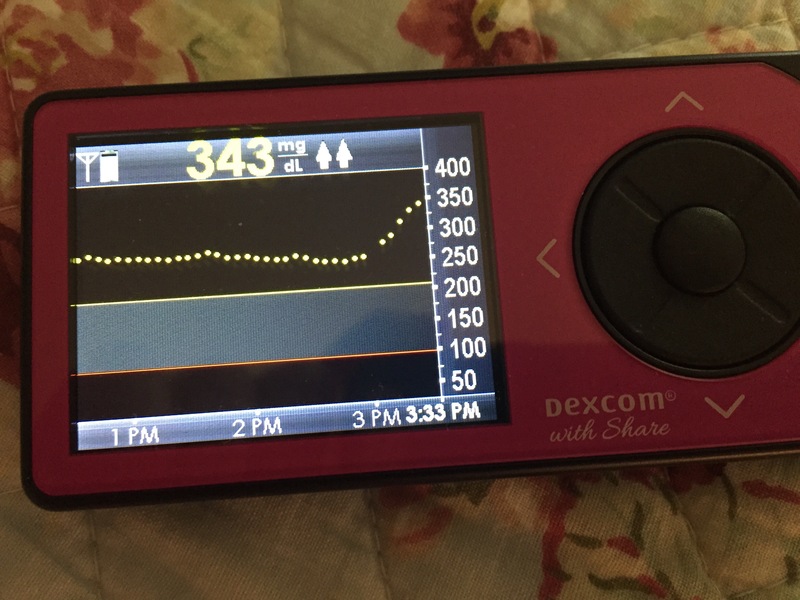 Eventually a light switch goes off and I jerk awake, covered in sweat, just in time to hear the CGM alert going off and to gulp down the juice on my nightstand. The kangaroo? Well, I have to be honest with myself: Although I appreciate the wonderful healthcare I receive in Boston, everyone needs a break at some point. I recently booked a few non-essential appointments closer to my Rhode Island residence in an effort to cut some traffic corners where I can. For now, I’ll reserve Boston for the vitally important appointments only. But as much as I want to pretend that I can handle all of this on my own right now- during the self-prescribed “month off”- the reality is that I still need the support of my healthcare team. Can’t we just wait for my doctors and nurses before the rabies shots? Can’t they just take it all away- diabetes and injections and highs and lows and fear- just for a few minutes? Please. I don’t say it enough, but I’m braver with their help. A few weeks ago, I attended some follow-up appointments at Mass General Hospital (MGH) in an effort to identify allergies that may be triggering an inflammatory response in my body. In other words, #JustSayNoToKetones, random fevers, crappy BGs, and the typical symptoms of a type 1 diabetic’s response to the dreaded “normal person sick” (NPS). A WordPress glitch is not allowing me to link to content tonight, but the background to my MGH visit can be found by searching for the blog post “Sleuthing” on verylightnosugar.com. In April, a scratch test confirmed what we already knew. I am allergic to the following culprits. Do not let their pleading-innocent faces fool you in their mugshots! We scheduled more intensive allergy patch testing in June, in which potential household irritants are temporarily placed on the skin to elicit reactions and identify allergy triggers. I visited MGH on Tuesday, Thursday, and Friday, logging hundreds of miles on my car and refreshing my memory on just how difficult Boston traffic is in the summer. I averaged 2 hours on the way there and 3 hours on the way back to Rhode Island due to traffic. On Tuesday, a nurse placed the patches on my back. She carefully explained each step in order to keep me calm and informed. And off I went for 48 hours of fun. I’ve always wanted to say that a crocodile, an alligator, a Great White Shark, a mountain lion, or a bear bit me. Seize the day, folks. The sites were a little itchy, but nothing unbearable. In true diabetes form, my skin was more agitated by the medical tape than anything else. Eventually I could tell that a baseball cap and perfume overload were not going to cut it; I needed to wash my hair without getting my back wet. Now I know how Tootsie and Ace feel: guilty as charged. Further examination revealed some irritation to certain patches. The nurse bid me farewell with strict instructions not to scratch at home. On Friday, I met with the doctor. The skin irritation had quieted down at that point, and she did not believe that I was reacting to the patches we tested. Further testing of a wider range of patches was recommended. TBD what that will reveal… But at least I’ll know how to wash my hair better for the next time. We also did a penicillin test, which involved scratch testing of the skin, shots, and eventual ingestion of penicillin. Being a healthcare nerd, I know that penicillin allergies are often misdiagnosed or that patients will outgrow the allergies, and I was hopeful that the one time I broke out in hives and ran to the bathroom every few hours while taking penicillin in college would be a fluke. It was. Your girl is free to take the antibiotic again, which is nice to know in case of any serious infections in the future. Now to update my MedicAlert bracelet! I will bask in the glory of removing a medical jewelry condition rather than adding one this time around! I took everything in stride the week of the appointments, mostly because of the superb care I was so blessed to receive at MGH. The appointments ran on time; I was seen by an expert in the field; the nurses were considerate and thorough; the receptionists were friendly; a volunteer greeter walked me to the elevator I needed; just wow. From the moment I stepped foot in the main lobby at MGH, I was treated respectfully. I was not just a patient. I was a human being. Just like everyone else in the building. This is a welcome change from some of my experiences at other facilities, and I urge those clinics (you know who you are) to take a page out of MGH’s book. There is a reason why MGH is repeatedly numero uno. The following week, exhaustion and burnout reared their ugly heads, and I was just… done. Done with diabetes, with healthcare, with publicly sharing my health story, with traffic, with pretty much everything. I wanted my privacy and my identity back- to not submit myself to one more needle poke or to being a patient incessantly pingpong-ing around the healthcare system. Alas, after lots of sleep and lots of time spent in good company, I can see the light more clearly this week. I am extremely fortunate to live near Boston and to receive topnotch care. It is okay to be tired. But I have to keep going, not allowing health woes to take over; rather, to know that I am trying. We all do this because we have to. Goodnight. Don’t let the scratch tests bite. *My condolences to those mourning the loss of friends and family members from the diabetic online community this week. I hope that this blog post provided some comic relief, but on a more serious note please know that you are all in my thoughts and prayers. Many thanks to BeatO for our recent interview, which can be found here. I enjoyed learning more about the BeatO app and how this project aims to help diabetics in India, and beyond. Check them out!